What is basic training? It is what beginners are expected to learn. In time and as experience is gained the more advanced teaching is shown while the basic way of doing things is reduced if not abandoned entirely. This is very typical in approach to teaching but it does not explain what basics is and how important they are. In contrast to basics, advanced training is interpreted as the goal and can be expressed in several ways. These maybe complicated, technical moves or dramatic , flamboyant , flashy movements that border on the theatrical, or fluid dance like motions. They have their place but the danger here is that Aikido becomes a series of tricks with people jumping and trowing themselves in an attempt to impress. 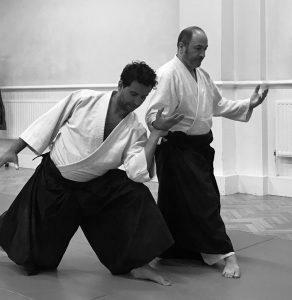 There is a place for flamboyant Aikido but the grounding and foundation must not be lost to it. It is often the case that this foundation was never established in the first place. In which case the attention given to basics , whatever ones level or years in training, takes on a new meaning and so we always go back to the “beginning”. Body work or tai sabaki (body movement) is a good place to start or review. This can be shown in Tai no henko in particular although nearly any form would do just as well. 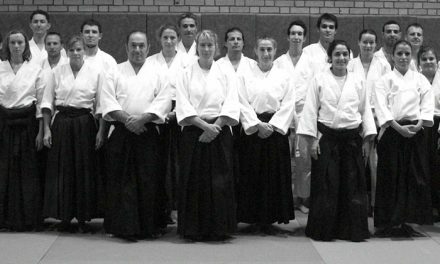 It is simple, uninteresting and lacks the apparent dynamism of “advanced” Aikido. On closer inspection we find that this is not the case as we get to work on our bodies, our hands and feet and other aspects of training. In preparation for tai-no-henko nage should assume a correct hamni or stance. The spine long, active and upright. Not stiff but not flaccid or floppy. The body weight shifts forward in a sword stance with weight mainly in the front leg while the back leg is straight and firmly planted in the ground. The chest open and relaxed. The lower body is where the movement will originate from. From this position your forward hand should extend out alive with all fingers open. Whilst extending your arm to the uke activity or tension in the body should not translate to stiffness in the shoulders and chest. In other words don’t get tense or upper body oriented. As Uke’s grip mould’s itself to nage’s wrist/body remain relaxed but alive. This grip equates to holding a bokken or sword. Little finger tight, subsequent fingers gradually lighter but still firm. The grip squeezes out any air pockets and as it would connect you to a sword it connects uke to nage. The connection is not merely a physical one. It is where uke’s and nage’s presence is “felt” through the quality of this contact. Once the movement begins your responsibility as uke is to stick to nage while retaining your general composure. Nage in turn absorbs this energy, receives it so to speak and while pivoting behind uke also retains the integrity of posture and composure. Once nage is behind uke both hands with palms up should be heavy with fingers open and alive and projecting outwards. Uke should tuck under the nage’s forearm. The nage’s weight then drops onto the uke. This is very simple exercise reveals that doing it well is in fact difficult. The quality of the movement and engagement is determined by the conditioning of those participating . As nage are you aware of uke. Is uke there? Not just physically but are they present in mind/body/spirit? The same awareness applies to uke. Is nage relaxed and solid or are they forcing the movement ? In many ways both practitioners are conducting Japanese sword work. The sword represents posture, readiness, calm, good footwork and handwork/grip. A good swordsman can feel the opponent through ones bokken tip and even before the bokken contact is made. The entire sequence takes a second or less to do and takes several hundred words to try to explain which in turn exposes the limitations of words within an article, which goes to show that back to basics also means that there is no use just reading or talking about Aikido, but it is physically throwing yourself back into training, back to the mat and back to the beginning. This exercise naturally extends to all the kata. 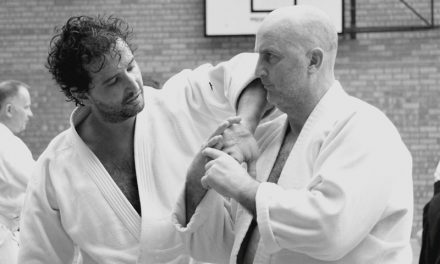 Inevitably the quality of ukemi within waza or kata is the outcome of this deeper engagement. Living, dynamic and potentially spontaneous rather than a predetermined and contrived one which could look impressive and athletic, but is ultimately empty. That is the difference between good ukemi/Aikido and jumping monkeys. It is with some hope that the following article does not come across as pretentious but helps instead to explain what was a profound and influential experience that changed my life. Join our mailing list to receive the latest news, updates and posts. Join our mailing list to receive the latest news and posts from Upside Inside.